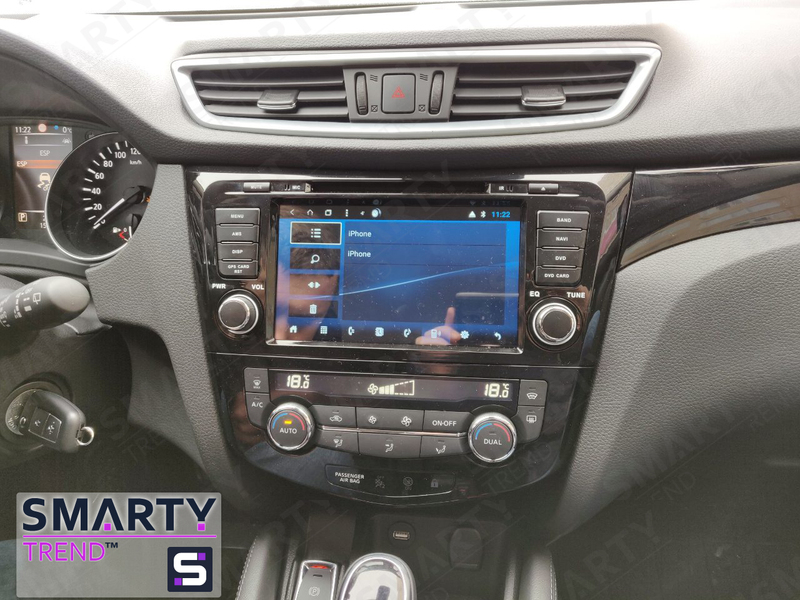 SMARTY Trend head unit overview for Nissan Qashqai. Nissan Qashqai 2014+ is an excellent representative of its class. Convenient, maneuverable car is ideal for both urban conditions and to go beyond it. A distinctive feature of this car is the build quality, reliability and the optimal ratio of price and quality of the car. But there are a number of questions that arise for every car owner. This is due to the functionality, namely their lack. The official representative of Nissan is always ready to help you in solving such problems, but the cost of these works is extremely high, and the most important quality leaves much to be desired. The best examples in this case is an example with standard navigation. Do not overpay The company SMARTY Trend glad to help you with choose the head unit, where the cost matches the quality! The SMARTY Trend head unit performs full support for all regular car functions. The steering buttons are no exception, depending on the type of buttons, you can either train the buttons on the steering wheel or if the buttons are digital, they will perform their regular functions without any programming or training. Thus, these deviece support all the regular functions of your car. To date, the presence of a rear-view camera is from the category of standard equipment. But what about those cars where it is not provided. SMARTY Trend receivers are easy to sync, and are compatible with any additional cameras you can install. The camera is activated when you turn on the reverse gear, so parking for you will no longer be such a problem as before, especially when you consider that not all drivers have a rich experience of driving a car. This function doesnt need special advertising, besides, it is not new in modern cars. You connect via the Blothoth of your smartphone, sync your phonebook. Thus, when you receive a phone call or SMS, there is no need to get off the road. You are making a call or sending using your voice. But you need to activate Google Assistant, or Siri. It is also a must have internet connection. The function is available for any phone regardless of whether it is Android or Iphone. In this case, as you can see the car interior, has changed in a better way. There is no problem when installing this unit SMARTY Trend. The quality of the frill and materials used exceeds the head unit. By its new features, this car is now not inferior to the cars of the last year of release. The company SMARTY Trend will help you to choose the deviece and provide you with all the necessary information for your car! Tag: Smarty Trend, Android head unit, Android, Head Unit, Multimedia, Entertainment, Nissan Qashqai, Car audio.